Porsche Design and BlackBerry® (NASDAQ:BBRY)(TSX:BB) today announced the elite, new, all-touch Porsche Design P'9982 Smartphone from BlackBerry and a second Crocodile model strictly limited to just 500 devices worldwide. Uniquely designed and expertly crafted, the P'9982 is exquisitely fashioned from high-quality materials and features a customized version of the BlackBerry 10.2 Operating System to give you the ultimate personal experience. "Engineered Luxury meets Powered Performance - what has been true for the first Porsche Design smartphone is even truer for the all-touch P'9982," says Juergen Gessler, CEO of the Porsche Design Group. "Once again the collaboration with BlackBerry has led to a device that implements our Iconic Style credo without compromises. With the P'9982 we extend our range of modern luxury smartphones and establish ourselves as a market leader in this segment." BlackBerry® Priority Hub - BlackBerry® Hub is the one place to manage all your conversations and notifications. The new BlackBerry Priority Hub intelligently filters messages to give you instant access to the conversations and content most essential to you, helping you stay organized and focused on the most important tasks. BlackBerry® Keyboard - The BlackBerry® Keyboard learns how you type, what words you use, and can correct your mistakes on-the-fly. It can also give you next-word suggestions that you can simply flick into your message, helping you type perfect text, every time. BBM™ Video with Screen Share - BBM™ Video with Screen Share takes video chatting further by letting you simply swipe to share what's on your display. With BlackBerry® Natural Sound your BBM Voice and Video calls will sound like you are in the same room. Camera Time Shift mode and BlackBerry® Story Maker - The camera's Time Shift mode starts capturing your picture before you even take it, giving you the power to pick the perfect moment. BlackBerry Storymaker lets you take a collection of photos and videos, and add music and effects, to create an HD movie that you can instantly share. BBM™ Now in any app - BlackBerry 10 continues to refine the unique communications experience of the platform. If a BBM message arrives, you can instantly reply to the message without even leaving the app you're in. 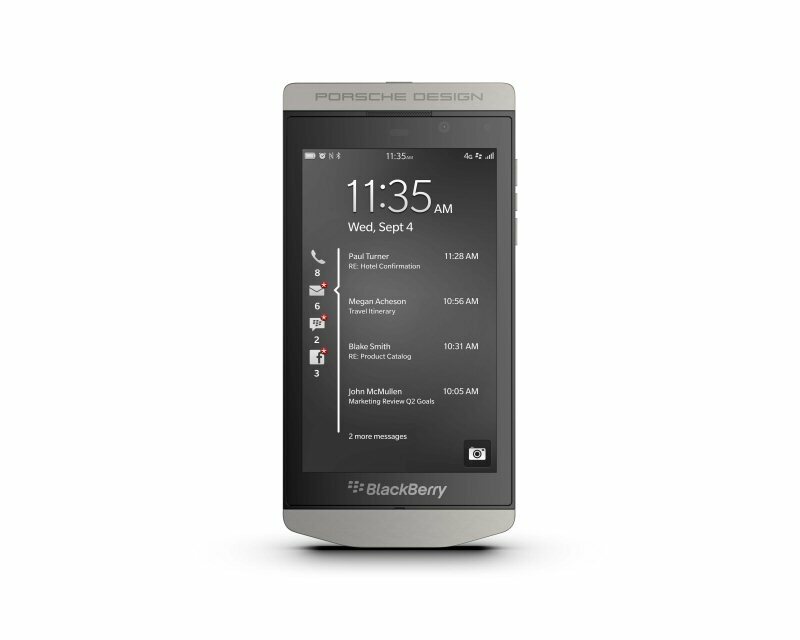 Apps for the Porsche Design customer - The BlackBerry® World™ storefront showcases essential apps for the P'9982 smartphone customer, including productivity apps, games, videos and music based on what apps you've downloaded. Get the best on BlackBerry World, uniquely suited to you. Find your individual look with exclusive Porsche Design accessories that have been specially selected to perfectly complement your new P'9982 smartphone. In box, you'll find everything you need including the premium stereo headset, a polishing cloth, USB cable for high-speed data transfer and an international charging kit. The P'9982 smartphone also offers exclusive after market accessories including handcrafted backdoors made from fine Italian leather that are available in three colors, so you can choose a look to express your individuality. The Porsche Design P'9982 smartphone from BlackBerry will be available from Porsche Design stores, select carriers and retailers around the world beginning on November 21 with the exclusive retail launch at Harrods, Knightsbridge, London. The limited Crocodile edition will be available beginning early December, and will be exclusive to the Porsche Design shop-in-shop at Harrods. For more information about the P'9982 please visit uk.blackberry.com/p9982, and to view a video of the smartphone visit http://youtu.be/huC1ae3XeGk. Porsche Design is a luxury brand and was founded in 1972 by Professor Ferdinand Alexander Porsche. The products represent functional, timeless and purist design, and boast an impressive innovative standard. All of the brand's products are designed from the Porsche Design Studio and are sold around the world in its own shops, as well as in franchises, concessions, high-end department stores, exclusive specialist stores and in the official online shop (www.porsche-design.com). To view the photo associated with this press release, please visit the following link: www.marketwire.com/library/20131118-p9982full.jpg.